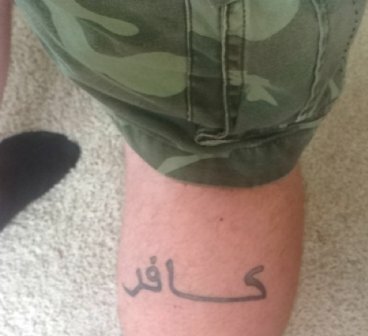 Eddie Bryant, a disabled combat veteran and Purple Heart recipient, says he was kicked out of the Florida Skydiving Center, also known as “Skydive Lake Wales,” because he refused to cover up his “kafir” (Arabic for infidel or non-believer) tattoo on his leg, which offended Qatari Muslims who were at the skydiving business. The veteran says he likes to skydive and was humiliated by the way he was treated. I tried calling the Florida Skydiving Center for comment, but they don’t answer the phone, and the voicemail is full (probably with messages of rightful outrage). I am a disabled combat veteran. I served in Iraq and worked in Afghanistan. 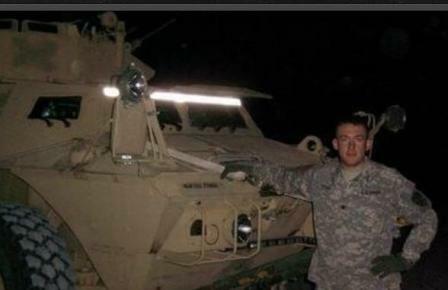 I took an IED because my country asked me too, and I was injured by a suicide bomber in Afghanistan. I have a Purple Heart and an ARCOM with Valor. I fully expect to be treated differently when I am visiting another country – when I am in America I expect equality and toleration; but what I experienced today is something that I never would have thought I’d have to go through in my own country. The country I fought for! The picture is of the tattoo I have. Here is the definition of said tattoo: “Kafir (Arabic: ????? k?fir, plural ????? kuff?r) is an Arabic term used in an Islamic doctrinal sense, usually translated as “unbeliever,” “disbeliever,” or “infidel.” The term refers to a person who rejects God or who hides, denies, or covers the “truth.” The Muslim’s from Qatar saw that tattoo and complained to the dropzone. Once they did so I was called to the back office and asked to cover it up by the OWNER. Not that I would, but its 80 something degrees here today, and that would be an unreasonable request. After I told her that I had no pants to cover it up she told me that she has DUCT TAPE that I can use to cover it. I told the lady that I was not going to cover it up, as it was nothing more than a tattoo saying “I am not a Muslim”. After beating around the bush for a few minutes entertaining me while I was trying to convince her otherwise, she asked me to leave. Can you imagine if the owners of this business had the guts to tell the Muslims, “No, we respect our veterans and their freedom of speech”? We’d all support the Florida Skydiving Center. Now, it has a legion of enemies on American soil who won’t patronize this business any longer. But, hey, the skydiving center is making a mint from the government of Qatar (which owns and operates the Terrorist News Network a/k/a Al-Jazeera), so they don’t care. Expect more of this humiliating treatment of Americans who served honorably, as more and more Muslim dollars are sought by American businesses. Cha-ching. **** UPDATE: Reader Raymond just alerted me that the Florida Skydiving Center ADMITS (on its Facebook page) to asking Eddie Bryant to cover up his tattoo at the request of Muslims. Yesterday afternoon we had an issue with a tattoo and the Qatar General bought it to our attention and that it was very offensive to him and to the other Qatar’s that were here. So manifest said she would ask Eddie to come talk to me about it. I asked Eddie if he had something to wear to cover it up while he was here and he said he did not, I said maybe a piece of tape or a little duct would work. The center denies asking Bryant to leave. But that they would ask this soldier that was wounded in the name of American freedoms to cover up his tattoo to appease Muslims . . . that’s extremely offensive and disgusting.